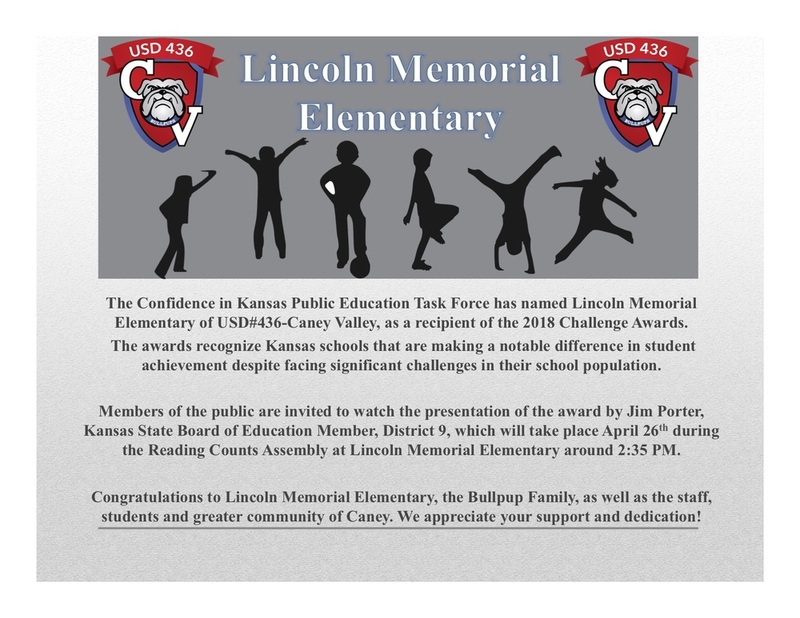 (CANEY, KANSAS) — The Confidence in Kansas Public Education Task Force has named 185 schools in 98 Kansas public school districts, including Lincoln Memorial Elementary of USD#436-Caney Valley, as recipients of the 2018 Challenge Awards. Theawards recognize Kansas schools that are making a notable difference in student achievement despite facing significant challenges in their school population. Since its inception in 2002, nearly 1,700 awards have been presented to schools across the state. “This award is a reflection of the outstanding staff and community, that believes in a shared vision to educate all kids to their highest potential. Being able to work alongside this staff with the amazing support of the community, we are able to achieve even beyond the great success that Caney has had over the years. We are proud to be the school of choice in Montgomery County where building up lifelong passion under proven success is what a Bullpup is all about,” said Blake A. Vargas, Superintendent. For more information about Lincoln Memorial Elementary receiving a Challenge Award, contact Blake A. Vargas at 620-879-9200, or visit caney.com. Members of the public are invited to watch the presentation of the award by Jim Porter, Kansas State Board of Education Member, District 9, which will take place April 26thduring the Reading Counts Assembly at Lincoln Memorial Elementary around 2:35 PM.